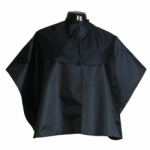 Keep your face painting clients clothing clean with these capes. Velcro fastening for ease of use. 100% waterproof. No more stains on clothing while they are in your seat!